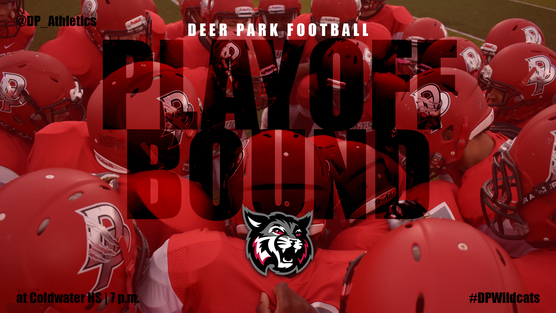 For the first time since 2007, the Deer Park High School Wildcats football team is headed to the OHSAA State Playoffs! Following a 14-7 victory over Mariemont High School to finish the season with a record of 7-3, the Wildcats will take on No. 1 seed Coldwater High School on Friday, Nov. 2 at 7 p.m. at Cavalier Stadium in Coldwater. Presale tickets for the game will go on sale at Deer Park Jr./Sr. High School starting on Wednesday. Tickets can be purchased at the main office during school hours (8 a.m.-3 p.m.) on Wednesday and Thursday. They can also be purchased Friday morning (8-9:30 a.m.) leading up to the game. Tickets will be sold for $8 (cash/check only). Tickets bought at the gate on Friday night will cost $9. A portion of all presale tickets will come back to Deer Park Athletics.